With elections round the corner, it seems even the retired bureaucrats from Tamil Nadu are in for politics. It is the turn of former Tamil Nadu chief secretary P. Rama Mohana Rao to take the political plunge. 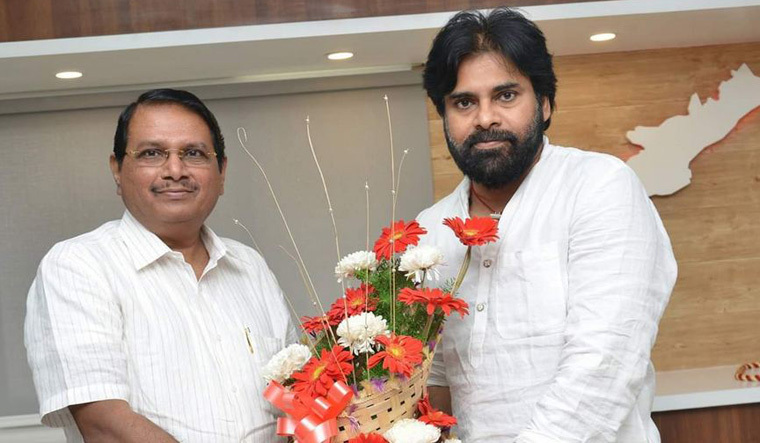 Rao was appointed as the political advisor to Jana Sena founder Pawan Kalyan on Monday. He was appointed by Pawan Kalyan himself at the latter’s party office in Vijayawada. “He offers hope to the people of Andhra Pradesh. He is the hope of women and youth in the Telugu speaking state,” Rao told THE WEEK. Rao called on the actor-politician at his Vijayawada office to formally join the party. “Pawan Kalyan had asked me to join him and guide him to win. I see the qualities of Jayalalithaa in him and so I agreed to join him,” adds Rao. Hailing from Ongole in Andhra Pradesh, Rao retired from service a few months before. The 1985 batch officer has spent his 32 years of service at various levels in Tamil Nadu. Rao was the secretary to the then chief minister Jayalalithaa between 2011 and 2016 and then served as the chief secretary of the state. He was removed from office in December 2017 following the allegations of Income Tax raids in his office and home. Rao was one of the close confidants of Jayalalithaa and was one among the few officers who Jayalalithaa trusted the most.